This Apron is not to be confused with the apron hand made by Bro. Layfayette Washington received at Mount Vernon in 1784. 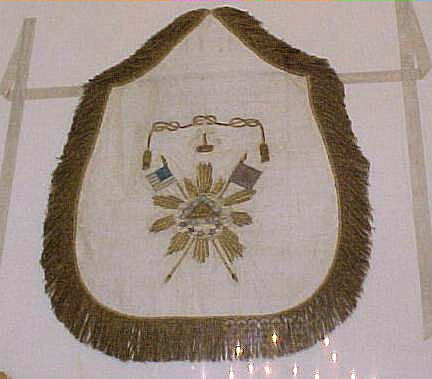 Along with this apron received from Watson and Cassoul, they included a letter celebrating the Masonic character of Washington and the Masonic destiny of the American Revolution. This Masonic destiny is the product of the enlightenment, which sought to take Europe out of the Dark Ages and into the light of liberty and democracy. Watson and Cassoul wrote “ In the moment when all Europe admire and feel the effects of your glorious efforts in support of American liberty, we hasten to offer for you acceptance a small pledge of our homage. Zealous lovers of liberty and its institutions, we have experienced the most refined joy in seeing out chief and brother stand forth in its defense of a newborn nation of Republicans. Your glorious career will not be confined to the protection of American liberty, but its ultimate effect will extend to the whole of human family, since Providence has evidently selected you as an instrument in his hands, to fulfill his eternal decrees.” January 23rd, 1782. Masonry was the product of the age of enlightenment, an era of political and social upheaval focusing on the things we take for granted today such as inalienable rights, democratic government. This focus on reason rather then religious tradition is based on Alchemical and Rosicrucian teachings which spawned in the dark ages propagating an evolution in science, influencing philosophers such as Francis Bacon, Isaac Newton, and those in German Existentialism. This focus on reason and understand is what transformed a union of laborers and craftsmen into a society that would reshape the face of western culture. 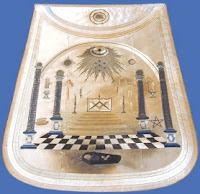 The Masonic philosophy was different depending on which part of Europe your lodge was in. This difference in philosophical emphasis is what accounts for the difference in the Masonic character across Europe, this is also what accounts for the main differences between the Grand Lodge of England, and the Grand Orient of France. American Masonry with its emphasis on liberty and individual rights grew out of the Grand lodge of England, which was primarily influenced by the works of John Locke. Locke is known as the Father of Classical Liberalism and British Empiricism. 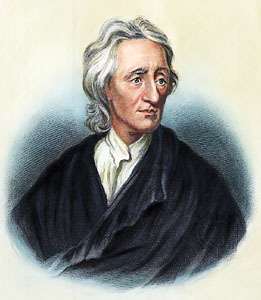 Locke was one of the most influential of the Enlightenment thinkers. Locke’s theories and contributions to classical republicanism greatly influenced the Declaration of Independence and the structure of the American government. Locke’s focus on western and religious tradition as a detrimental part of who we are as a person and where we are going, is what greatly separated him from the more radical thinkers of the time. This is reflected in the implementation of Greek and Roman mythology in the early artwork and architecture of America. Locke also introduced the idea of a separation of church and state and its relation to a social contract, which greatly influenced the Founding Fathers. Locke believed that people in a state of nature would defend and care for each other without government protection. But they would have no guaranteed protection of their rights and would live in constant fear, so people would willingly come together to form a state. This state would act to protect the lives, liberties, and properties of those who lived within it. Unlike social contract theories before which claimed the right of the government came from the authority, Locke claimed that the right of government to rule came from the consent of those who were ruled. These moderate views by today’s standards were revolutionary at the time, and were the main political foundation of American Masonry. This influenced the founding Fathers to create a national character, which respected liberty as well as religious beliefs of others. This Masonic respect of all religion as light was what set American and British Masonry apart from French Masonry. 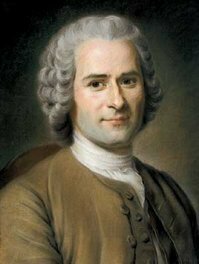 This is primarily because of the works of Jean-Jacques Rousseau and its influence on the French Revolution and the Grand Orient. Bro. Rousseau saw the enlightenment period as an overthrowing of the religious establishment. Rousseau had little respect and admiration for traditions and western religious values. He saw the enlightenment as a dramatic change in social consciousness. Rousseau believed liberty was possible only if it were the direct rule of the people as a whole in law making. But Rousseau did not believe people understood their “real will” so they could not rule themselves within the confines of their social consciousness. Rousseau believed that a just society could not come about until a great leader, or “legislator” arose to change the values and conception of the people. He believed a true will of the people cannot exist when focus is placed on the individual. So the people must subjugate themselves to the laws of the “legislator”. By this Rousseau understands that laws and subjecting to laws are an expression of freedom. It is not a stretch to understand how the American Revolution as influenced by individual sovereignty was a just war, which led to a true republic, as opposed to the French Revolution, which was a bloody and violent revolution, which eventually led to the dictatorship and tyrannical rule under Bro. Napoleon Bonaparte. This trend in the differences of philosophy and political consciousness is relevant to understand the development of the Masonic philosophy. 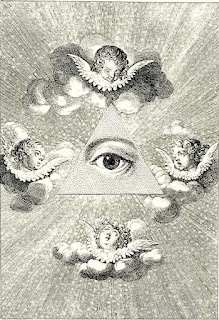 The Original Grand Orient of France claimed responsibility for the French Revolution and enforced an atheistic and secular view of Masonry which led to them being derecognized by the Grand Lodge of England. This is the difference of Rousseau’s influence on Masonry which denounced religion and Locke’s influence which respected all religions. Under the reign of Napoleon not even the Grand Orient was safe as it was institutionalized into the regime only to merge with the Ecossais Rite in 1804. It is interesting because as was addressed in part one of this article, Washington believed that the American character should be a selfless individual, dedicated to serving humanity and God. This spirit centered approach is what I believe to the foundation of Masonry and America. This foundation is what led to success for the colonies while France fell to tyranny rejecting the spiritual nature on humanity. To understand the evolution of the Masonic character we must look at the origins of the philosophical foundations of modern masonry. Masonry is referred to as a progressive science, but I beg the question, are we still true to our original intent and mission? George Washington and the other Founding Fathers valued the deep philosophical nature upon which the craft was founded. We have forgotten our roots to Rosicrucianism, Alchemy, and the enlightenment philosophy. In fact most members that we have raised in my lodge in the past few years have been mostly self-serving interested in wearing a ring or making corporate connections. Lodge meetings have become nothing more then a reading of minutes and small-minded bickering. This new “Corporate Masonry” has watered down the average Mason’s understanding of philosophy, ritual, and the seven liberal arts and sciences. How have we allowed what was once the great influence of the western world be reduced to a marketing tool which raise dozens of Masons who get a ring and never set foot in a officer’s chair. In my personal opinion, I believe the Founding Fathers would be disappointed by the state of Masonry. There is no focus in finding quality members and to further enlighten them. We have lost sight of our true purpose to make those business connections or pushing an agenda to mainstream a washed down version of the craft? But why, why change years of tradition for this Corporate Masonry. You cannot market Masonry to my generation by what is popular in the media or in movies. 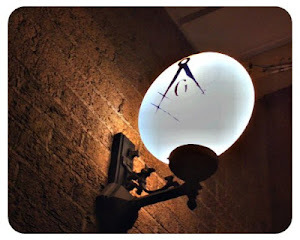 Masonry is a calling, in which like-minded men are drawn to a path of light and hope. Men are born Masons we choose to walk the checkered tile when we are ready to emerge from the darkness. I feel Masonry has lost its mystery and allure and as a younger member I feel my generation is willing to work for our degrees, to learn Latin phrases and memorize their meanings, to discuss the philosophy and origins of the craft, to learn full form catechisms. We wish for a return to tradition of our past brothers. I know a lot of Masons are afraid. There is a lack of membership, lodges are closing, it seems as if Masonry is no longer important to the American Character. But trust me if you focus on the right members, the quality members who are willing to work for their Masonic experience, they will appreciate it more and get active. 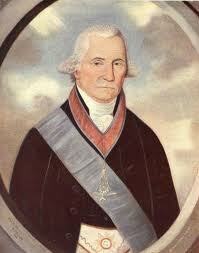 So let us return to our traditions, let us remember the Masonic character of our Founding Fathers. Let every Mason know that Freemasonry is the foundation for the American character, and the philosophical tool for bringing humanity out of the dark ages and into the enlightenment.